Mary Thomas was born in August 1944 on Alice Downs Station in the East Kimberley. She is the mother of nine children, all of whom are now grown up and, like Mary, well educated and well respected community members. Mary lives in Warmun Community (Turkey Creek) and is an important Gija law and culture keeper. She grew up and worked on Alice Downs Station until she moved to Warmun Community. Mary has been a tireless worker for the women and children of her community, teaching culture, craft, art and associated Dreamtime Stories of the land and her heritage. Mary speaks a number of dialects and is a dedicated linguist, interpreting for meetings, court procedures and very importantly for a publication about the Gija people titled ‘Digging Sticks to Writing Sticks’ by Sister Veronica Ryan of the Catholic Education Department. 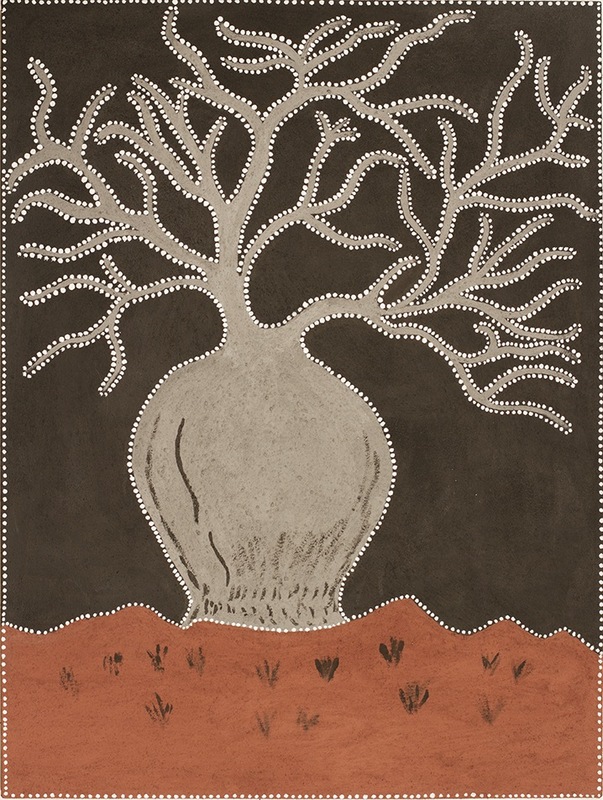 Mary’s artworks are neat and precise landscape works, complete with in-depth Ngarranggarni (Gija Dreaming) stories. 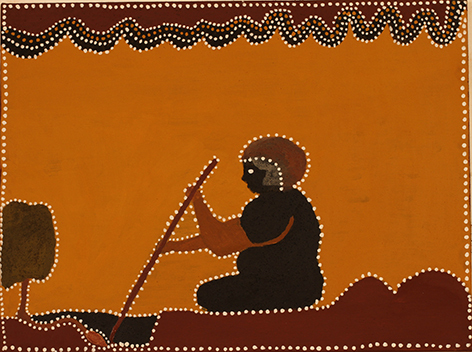 Mary is actively involved with ‘Two- Way’ worship in Warmun which is a combination of traditional Gija Ngarranggarni (Dreaming) and Catholicism. Thomas is team leader in Warmun’s award-winning drug and alcohol rehabilitation program. She is also a traditional healer. She holds much knowledge about the therapeutic qualities of many plants found in Gija country and is an expert in their preparation for use in traditional therapies. Thomas paints the Ngarranggarni (Dreamings) of her country on Alice Downs Station. Through her paintings, she passes on these stories as well as relating events from the more recent past since white contact. Thomas’ granddaughters, Julieanne and Johnine Echo also paint, taking their grandmother’s country as the subject of their work.